Are you a homeowner planning a home improvement, major landscaping project or cleaning up your garage or shed? Then our 20 Yard Roll Off Dumpsters may be just what you need. When you have any major project involving construction, demolition or landscaping, you will end up with piles of debris. For many, a 20 yard dumpster is the last thing you think of when planning a remodeling project until you continue to see the curbside waste service ignoring it. They will not take your construction debris away and you will be stuck to find another way to dispose of it. One of our 20 yard roll off dumpsters is the affordable and perfect choice for any of your home renovation project needs. Contact us, your 20 Yard Roll Off Dumpster Providers for help or a free quote at (888) 413-5105 toll free. Our 20 Yard Roll off dumpsters have an open top, rectangular and have wheels so they can be “rolled off” the truck. 20 Yard Roll off dumpsters are delivered by truck to your project site and will be emptied as frequently as you need. All of this at an affordable price. By choosing a 20 yard dumpster for your home improvement or construction project, you are guaranteed quality and reliability. In order for you to get an idea of home much debris your 20 yard dumpster will hold, each cubic yard will roughly hold 15 (thirteen gallon) kitchen-sized trash bags or about 6 (thirty gallon) large trash bags. Please refer to our pictures and dimensions for an idea of what our 20 yard roll off dumpsters look like. 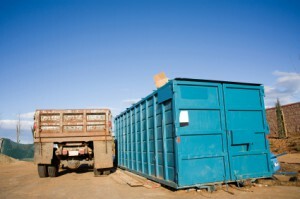 While planning on your 20 yard roll off dumpster, there are a few things to consider. You will want to make sure you have enough space at the project site to hold our 20 yard dumpster. We recommend that you allow for double the width and double the height to accommodate the 20 yard roll off dumpster. You will also want to allow an additional 10’ for the door to swing open at the back of the dumpster. Also you will want to make sure there is enough room for the delivery truck to pull in and out for deliver and picking up the dumpster. For questions regarding the space requirements, please call 20 Yard Roll Off Dumpsters at (888) 413-5105 for answers. While there are many items and debris allowed in the 20 yard dumpster, there is also a list of items that are not safe or allowed to be thrown away into the dumpster. Some of the items are: hazardous waste, medical waste, dirt, industrial waste, radioactive material chemical products, oil filters, herbicides & pesticides, solvents, paint (except completely dried latex paint cans, no liquids), other flammable liquids, aerosol cans, propane tanks, motor oil, transmission oil/lubricating/hydraulic oil/oil filters, contaminated oils (mixed with solvents, gasoline, etc. ), antifreeze, petroleum contaminated soil/lead paint chips, tires, appliances, fluorescent tubes, batteries, computers, monitors, televisions, microwaves, railroad ties, asbestos, animals, barrels and all liquids. All debris and material must be level to the top of the container and nothing can be sticking out of the top, this is for your safety and for the safety of friends and family. A 20 yard roll-off dumpster is an open-top dumpster with a rectangular shape, that utilizes wheels to smoothly aid rolling the dumpster into place. The open-top dumpster container is specifically designed to be transported by roll-off trucks. The 20 yard roll-offs are used to hold loads of construction and demolition waste or other debris. The construction waste can originate from a building site where there is construction, renovation, or something being demolished. The 20 yard roll-off dumpsters are commonly used for clean-up projects that have a lot of material that needs to be taken away. The material in the 20 yard roll-off may be taken to either a landfill, recycling plant or disposed/recovered of in some other way. Ordering your roll off dumpster is easy; enter your zip code for vendors in your area, select the appropriate roll off dumpster size and request a free quote! Or call toll free, (888) 413-5105.